With the body looking fairly complete at the end of 2007 maybe this would be the year for paint. Actually it turned out it would be, but Robert would end up spraying the colour coats in the winter. Plenty of other details to take care of before he could start paint. 26th May 2008. The bonnet had ripped off during the crash . Fortunately Robert still had the mould he'd used to make it. 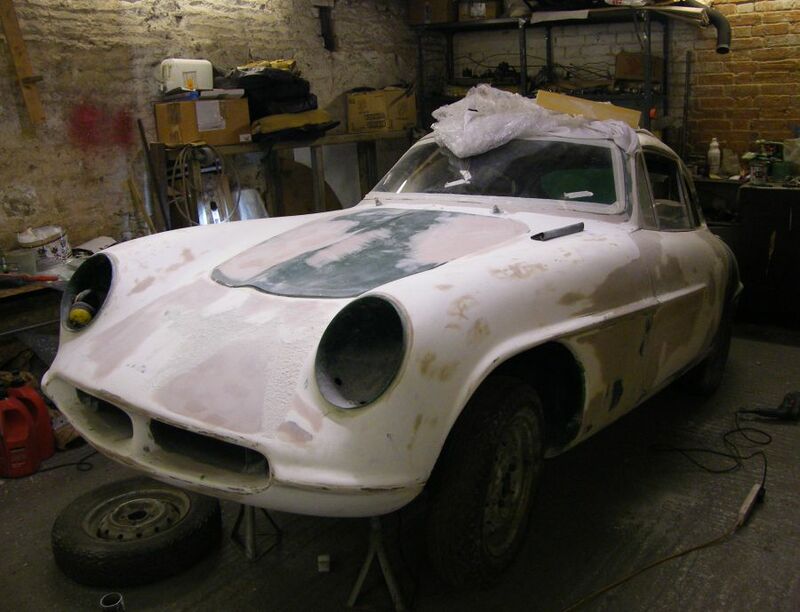 The mould had been formed from the original bonnet which had itself been poorly repaired after a crash (and had therefore been too heavy). This replacement has turned out much better than the previous replacement bonnet. It sits remarkably evenly and doesn't bend up at the edges like the last one. 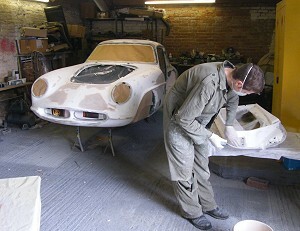 Even so it requires a great deal of body filler and dust to get it just right. Seats have appeared in the car since we last looked inside. Looks like Robert has been experimenting to see how little cushioning he can get away with. 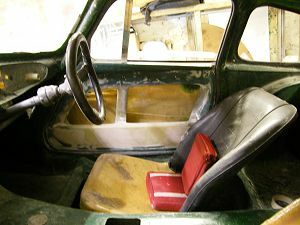 Notice also the steering wheel which has been bent backwards at the top to clear the windscreen. Just another example of the innovation in this build. Much progress has occurred in the way of door and bonnet catches. I'm unsure of where we've ended up, but my last understanding was that the bonnet catch had been sourced from a Renault 5 and the door latches from a Vauxhall Astra. Apparently the original catches fitted to the Rochdale weren't very effective. There's been talk of some paint being applied during 2008. 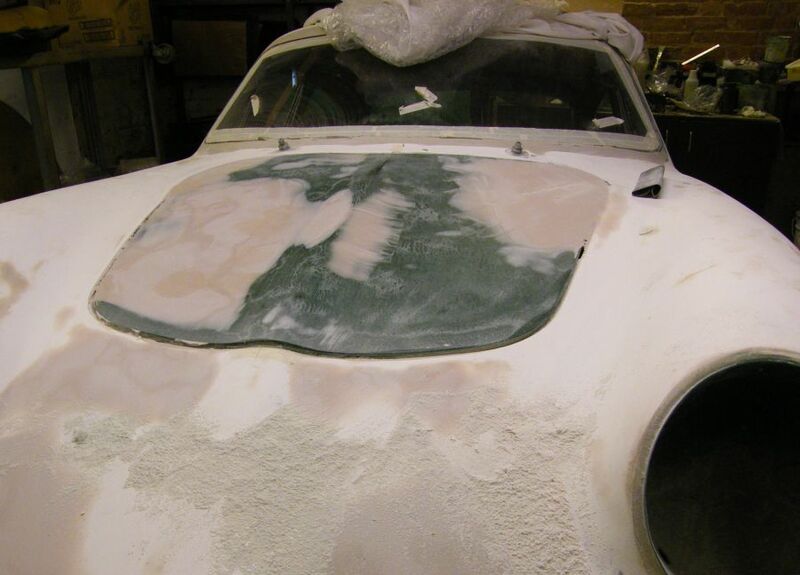 Specifically the plan was to paint the car over the couple of weeks in June when I'd be traveling to the North Pole. Sadly that's been cancelled, so there's no rush now. Still, I've a feeling this is the year for paint. 24th August 2008. There's been a great deal of body filling going on over the last few months. This weekend I saw some masking paper being applied to the car which is normally a sure sign of painting, so I rushed inside for the camera. Rushing outside again it seemed the masking paper was just a diversion from filling. Glassfibre car owners might be interested that so far there's only been dry sanding of filler. Apparently last time when wet sanding was used water was absorbed into the GRP which later caused huge bubbles to appear in the paint. 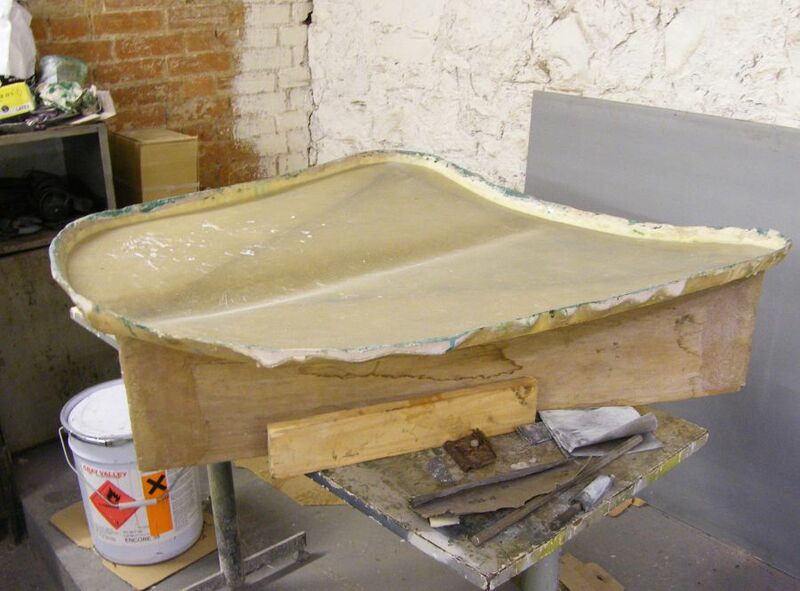 It's a compromise as the dry sanding limits fineness of sandpaper. Hopefully the nice stable 2 pack high build primer can be used to fill the sandpaper scratches. 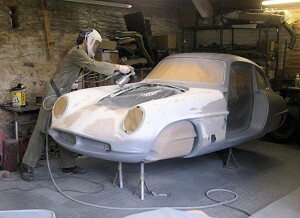 I popped outside a little later on to see self etch primer being applied. I've no idea how the roof was tackled but there weren't any step ladders about. It's a pity to have missed that bit. The insides and underneath have been masked off. Paint is heavy so there's no point getting any on those parts which already look green with the colour in the GRP. Self etch is crucial as a start to glassfibre painting. It contains acid that bores it's way into the plastic to make a decent start to further paint coats. Which will follow. It's very tricky to work in the garage while someone else is spraying 2-pack, so I didn't go into the garage to take any more photos until the start of 2009.